Whether you are an advanced climber tackling 5.12 pitches or just getting yourself off the ground, we have a climb around camp to match your experience level. 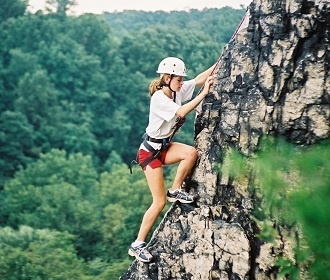 Stone Mountain Adventures creates a supportive, friendly environment in which campers can challenge themselves on vertical adventures while developing new skills. At SMA, campers literally reach new heights! 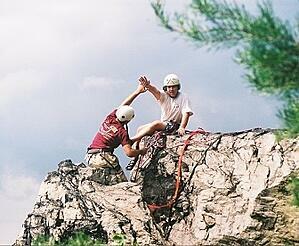 We own a climbing area called Donation Rocks that is part of our camp facility. We offer rock climbing every day at multiple sites, giving campers the opportunity to develop strength and skill while having fun exploring different climbs. Our rock climbing program at Stone Mountain Adventures is designed to give inclined campers the opportunity to immerse themselves in the activity. We have refined our program to include the perfect mix of instruction and climbing time while campers hang out with like-minded friends at the rocks each day. We have developed a training program that helps climbers of every level develop skills and build valuable climbing-specific strength. Our climbing campers leave SMA more proficient and confident than they were when they came, and it is this sense of independence and accomplishment which often compels them to return year after year to refine their skills and climb every day. At Stone Mountain Adventures our climbing instructors are focused on safety, skill development, personal challenge, and fun. Our experienced instructors are detail-oriented and have all been certified in rock-craft, general safety and camper specific instruction during our pre-camp staff training. The counselors who instruct climbing are passionate about it and excited to share that passion with our campers. Most importantly, they create an atmosphere of safety so that campers feel supported to challenge themselves on new routes. 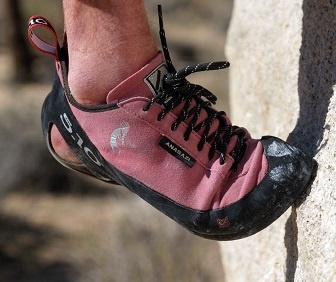 Bouldering is the sport of climbing boulders, usually without any ropes. For safety, there is always a spotter ready to help support the climber, who never climbs above their spotter’s chest. A “crash pad” on the ground provides extra cushioning and protection. Hunter’s Rocks is a boulder-strewn ridge located 6 miles from camp in an area called Martin’s Gap in Rothrock State Forest. The classic boulder field provides our campers with potentially hundreds of boulder “problems” - not to mention beautiful views! Having Hunter’s Rocks and Donation Rocks available for climbing every day helps to make SMA an awesome summer camp for teens who already love to rock climb or are interested in learning! 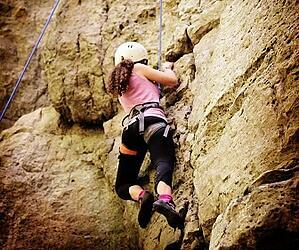 The sport of rappelling involves a controlled descent on a rope down a rock wall or cliff. 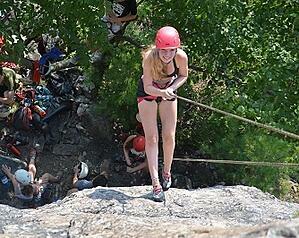 At Stone Mountain Adventures, when we get the chance to rappel ourselves, we take it! We attach ourselves to a small device that enables us to control our own lowering speed, while always wearing a helmet and a harness. It is SO MUCH FUN! 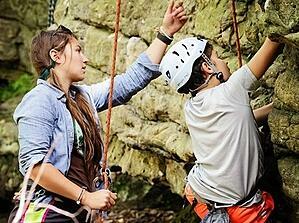 The highlight of the SMA Rock Climbing program each session is the camping overnight. This is a great opportunity for interested campers to get out of camp, do some amazing rock climbing, and sleep out under the stars! It is truly a unique experience to set up a campsite near the base of the rocks, climb until dusk, then warm up next to the campfire to share stories and roast marshmallows. Then, it’s back up at dawn for more climbing! 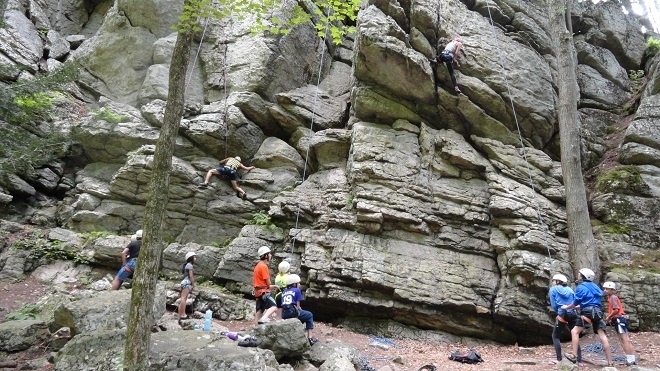 A rock climbing overnight is something that every climber at SMA should definitely experience. "At home I climb in a gym and it's good, but at SMA climbing on real rocks has been amazing! Here I climb almost everyday. My climbing skills have improved so much. I also love the variety of climbing offered at SMA. The climbing camping overnight is an experience I will never forget!" If rock climbing is something you have interest in or are passionate about, Stone Mountain Adventures is the camp for you!